Italians have a fantastic ability to design bikes that are striking and different. The Ice is just that, totally unique, beautiful – but in a quirky kind of way. The crazy look of the bike is only enhanced when you get closer. The frame dominates the bike and has deliberately been made a feature of the styling. The plastic jagged ice shaped side panel is great and the dual rear mud-guard very cool. 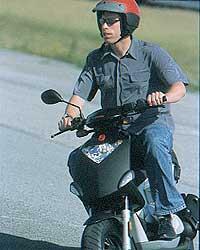 But practical touches such as the replaceable crash protects show that Gilera realise that accidents can happen. Sitting on the bike I was pleasantly surprised, being over six foot I was expecting to find it a bit of a squeeze, but it was actually really roomy. Rocking it off the centre stand, the UK version will come with a sidestand as an optional extra, I pushed the starter. And nothing happened. Being a twist and go you have to hold in the rear brake to get the motor to start – with the assembled Gilera press officer looking on I pretended I knew this and that I was just checking. Another stab and I was still not convinced the motor was running. The bike is just so quiet. But now it was time to try riding it, and with a bit of right hand and I was off. Well in truth the throttle only effectively has two positions shut and wide open. But it gets up to its top speed of 33mph quite rapidly and when you get there the handling is so light and quick, mainly because the bike weighs next to nothing. But should rapid braking be needed, and with Italian drivers it often is, the front disc and rear drum stop it instantly. I reckon that stoppies are a distinct possibility. I had a huge grin over my face when I finished the test and almost wished I could repeat my scooter-riding days.